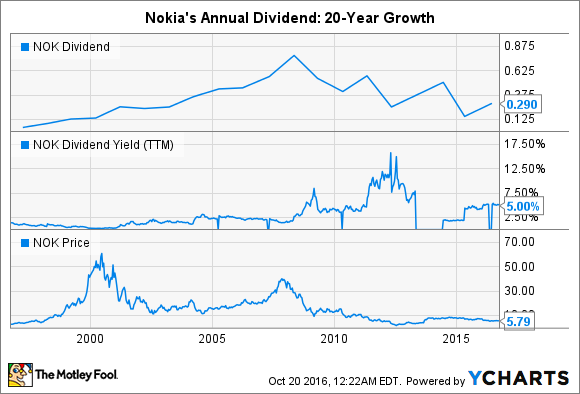 Is Nokia Corporation a Reliable Dividend Play? Read this before you buy Nokia for its 5.8% yield. In a search for high-yielding dividend stocks, many investors might have noticed Nokia's (NYSE:NOK) 5.8% yield. That yield is based on the $0.29-per-share annual dividend that was paid in July, which included an ordinary dividend of 0.10 euros and a special dividend of 0.16 euros per share. That yield looks tempting, but does it make Nokia a good income play? Let's examine its dividend history, payout ratios, and growth forecasts to find out. Nokia has had a very inconsistent track record with raising dividends. During the late 1990s and early 2000s, payments were consistently raised as Nokia dominated the mobile market. But that heyday ended in 2007, when Apple released the iPhone. Declining sales and earnings resulted in lower dividend payments, although its yield skewed higher for several years as its stock price plummeted. Nokia didn't pay a dividend in 2013, but then paid about $0.51 per share in 2014, after Microsoft acquired its ailing handset business for over $7 billion. That payout then dropped to $0.16 per share in 2015 before being raised to $0.29 this year with the aforementioned special dividend. Since Nokia sets its dividend every year at its annual meeting (usually in May or June) and pays it shortly afterwards, we won't know what the yield will look like until next year. Therefore, income investors looking for reliable dividend hikes year after year should probably avoid Nokia. The easiest way to tell if a dividend is sustainable is by seeing if a company's dividend payments exceed its free cash flow (FCF). If its FCF payout ratio (the percentage of the FCF spent on dividends) exceeds 100%, then the dividend will likely be cut. 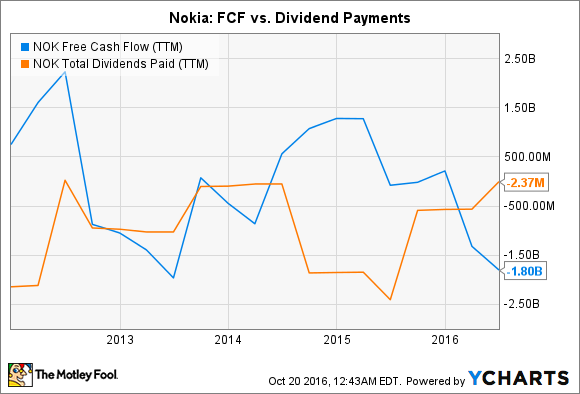 A comparison between Nokia's FCF and dividend payments over the past 12 months reveals a serious problem -- its FCF payout ratio is a whopping 132%. To make matters worse, its FCF is in decline, indicating that the company will likely propose a much lower dividend next year. By comparison, Nokia's rival Ericsson spent 94% of its FCF on dividends over the past 12 months. After selling its handset business to Microsoft, wireless infrastructure equipment became Nokia's biggest business, accounting for over 90% of its top line last quarter. To scale up that business, it acquired Alcatel-Lucent for around $17 billion. That big purchase, which has weighed down its free cash flow, made Nokia the third-largest wireless infrastructure company in the world after Huawei and Ericsson. Nokia also secured big infrastructure deals with China Mobile and China Telecom to widen its moat in China. Unfortunately, the wireless infrastructure market has been a brutal one. Many telcos have been postponing infrastructure upgrades in favor of digital expansion efforts in streaming video and advertising. Enterprise spending remains sluggish, and competition from cheaper rivals like Huawei has been tough on Nokia's top and bottom lines. Last quarter, Nokia Networks' revenue fell 11% annually as its operating profit plunged 39%. That pressure, exacerbated by the costs of integrating Alcatel's businesses, is expected to cause Nokia's earnings to fall 50% this year. Nokia is a textbook example of a dividend trap. It has a well-known brand and a high yield, but it falls apart quickly when we examine its dividend history, payout ratio, and industry headwinds. Therefore, investors who want to invest in a more connected, mobile world with a solid dividend should stick with telecom giants AT&T (NYSE:T) and Verizon (NYSE:VZ) instead. AT&T and Verizon respectively pay forward yields of 4.9% and 4.6%. AT&T has hiked its dividend for over 30 years and Verizon has done the same for almost a decade. Both companies have wide competitive moats, and aren't as vulnerable to competition or enterprise slowdowns as wireless infrastructure equipment vendors like Nokia.